“ARCHBISHOP EXCOMMUNICATES PRIEST FOR SUPPORTING SOCIALIST CANDIDATE” No, this isn’t a recent headline from Direct Action, nor does it refer to a Latin American priest from the 1970s who was preaching Liberation Theology. In the last two decades of the nineteenth century, a New York City priest became a cause celebre in both secular and ecclesiastical circles for his outspoken support for a radical candidate for mayor of New York – none other than Henry George. Born in New York City of Irish immigrant parents in 1837, McGlynn was raised in Manhattan and ordained in 1860. 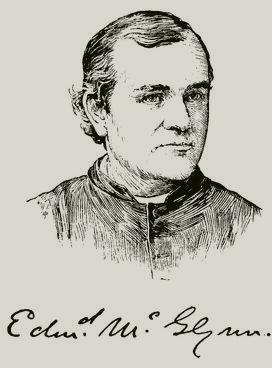 His eventual parish, St. Stephens, was the largest and most influential in the U.S. and he himself became the most popular Catholic priest in NYC and the nation. Besides being a priest, McGlynn was a deep intellectual. He was an active member of the Accademia, an informal study group of liberal Catholic priests. On political issues, the group supported Radical Reconstruction in the postbellum South, Fenianism in Victorian Ireland, supported using the vernacular in the Mass, and opposed the temporal power of the pope. On religious issues, members argued for allowing priests to marry and wondered aloud if mandatory “celibacy retarded emotional growth, making priests selfish and lonely.” McGlynn also supported public schools and abolishing poverty by public action. McGlynn and George were both radical reformers and spellbinding orators – who wouldn’t want to have been a fly on the wall when they finally met in 1882? 4 years later, when George ran unsuccessfully for mayor of New York City (in which he was seemingly robbed of victory), McGlynn delivered the nominating speech, despite warnings not to do so from his superior, Archbishop Michael Corrigan. The archbishop removed him from the charge of St. Stephen’s, and McGlynn was summoned to appear at the Vatican. But how’s this? – he ignored the papal demands, and stayed put! He was thus excommunicated in 1887 by Pope Leo XIII (this was eventually overturned 6½ years later). The main Catholic reaction to George was Leo’s 1891 Encyclical, Rerum Novarum which reduces “equal rights” to mean only rights to buy land from its rightful owners and to enjoy eternal life hereafter. A “just wage” was one high enough for the subsistence of the worker, but not of the worker’s family. It was not explained how the workers might save from such a wage. About one-third of the text of Rerum Novarum consists of upholding private landownership, upheld by police power, and taking nasty digs at the motives of nameless persons who believe otherwise. Notably lacking is any reference to the teachings of Jesus. Meanwhile, George’s works were placed on The Index (i.e. of forbidden works). His own funeral 3 years later drew tens of thousands of New Yorkers into the streets of Manhattan to pay their last respects to a man whom they believed was fighting the establishment to give them a better life.